Quick release aluminum extrusion back fence with sliding MDF cheeks. 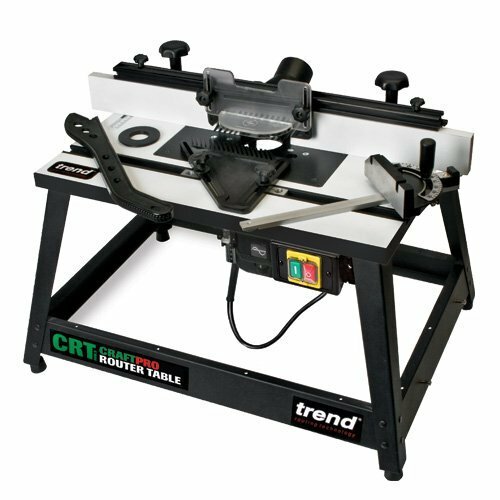 The CraftPro Router Table will suit craftsmen & woodworking enthusiasts. It is packed with the necessary features to maximise the versatility of all popular portable routers. Large laminated MDF table. Quick release aluminum extrusion back fence with sliding MDF cheeks. Removable 6.35mm thick aluminium insert plate with 98mm diameter aperture, pre drilled for Trend TBC routers and T11 routers. Quick Raiser and Quick Release facility for the Trend T11 router. High back fence with fully adjustable guard assembly. Fully adjustable side finger pressure. Full perimeter leg stand with adjustable feet. Two insert rings 31.8mm and 67.5mm diameter to reduce table aperture. Lead on pin for bearing guided curved work. Edge planing facility on back fence of 1.4mm and 2.4mm. Cable management clips. No volt release switch. Mitre fence with zeroing and spelch block facility. Bench fixing brackets. Router not included. For UK sale only. 115v routers over 1850W (including T10 and T11) cannot be used with no volt release switch router tables. Dimensions: For UK sale only. Rating=Craftsman Voltage*=115 volt Table top size=610x405x26mm Bench height=410mm Router cutter aperture=98mm Max cutter dia=86mm Insert ring sizes=31.8mm, 67.5mm Backfence height=68mm Dust spout aperture=57mm Edge planing up to=1.4 & 2.4mm Weight=13.6kg End of life=See below for Environmental Policy link Not intended for continuous production or production line use. *115v routers over 1850W (including T10 and T11) cannot be used with no volt release switch router tables. .